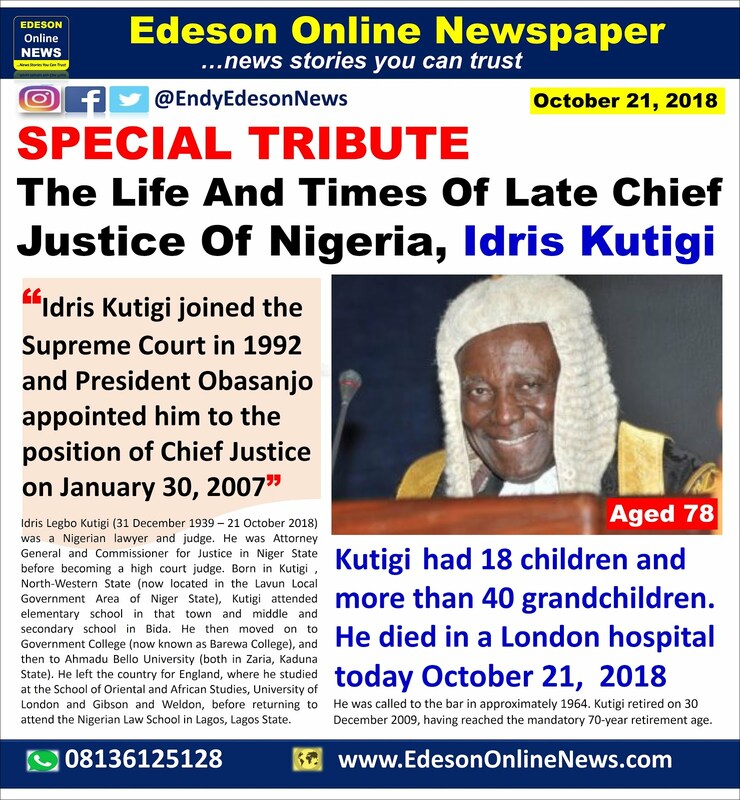 Idris Legbo Kutigi (31 December 1939 – 21 October 2018) was a Nigerian lawyer and judge. He was Attorney General and Commissioner for Justice in Niger State before becoming a high court judge. 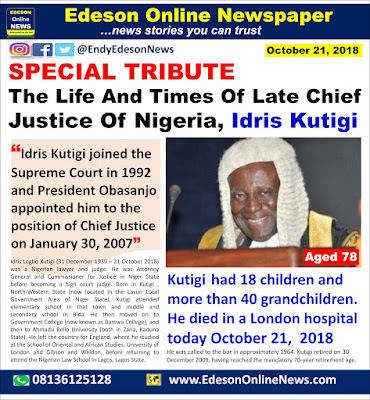 Kutigi joined the Supreme Court of Nigeria in 1992 and served as Chief Justice from 30 January 2007 until 30 December 2009.
returning to attend the Nigerian Law School in Lagos, Lagos State. He was called to the bar in approximately 1964. He joined the Supreme Court in 1992 and President Olusegun Obasanjo appointed him to the position of Chief Justice to succeed the outgoing Salihu Alfa Belgore. Kutigi retired on 30 December 2009, having reached the mandatory 70-year retirement age. Kutigi had 18 children and more than 40 grandchildren. He died in a London hospital on 21 October 2018 following a short period of illness. What this profile did not say is that he might be the only one in Nigeria history that all the tribe believe in his integrity. When he was appointed chairman of confab. No one ask or question his integrity or fairness to do the right thing. I standing ovation pls. Onwukwe Enyinnaya Bright, Niger state is in the North West geo political zone of Nigeria. So, Endy Edeson is right in that aspect of his report.